The Inaris HLS Player is used for the Quickline UHD set-top box for the playback of live TV, replay content and network PVR via OTT. 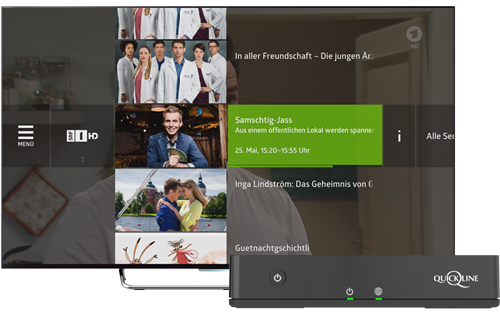 The high requirements for fast channel change, start of media playback and media positioning are perfectly fulfilled with the Inaris HLS player. The player has been further optimised to work hand-in-hand with the Broadpeak streaming server. Many improvements were introduced for increased robustness during playback. VOD Everywhere is an end-to-end solution from SES to bring high quality content to set-top boxes for emerging markets, where no or only low bandwidth Internet connections are available. The content is pushed with the broadcast signal to the devices and stored locally. Besides classic push on-demand content also live events are supported. In this case the content is provided as an HLS stream also in the broadcast signal. For playback of the HLS stream we use our Inaris HLS solution on a low-end HiSilicon Linux platform. Because our HLS Solution uses the available resources in an efficient way, it perfectly works with the memory and performance limitations. With HLS one or more audio streams can be combined with the video stream in one multiplex. However, if multiple high quality audio streams are to be supported using only one multiplex wastes a lot of the available Internet bandwidth. Therefore, HLS allows to separate the audio streams from the video stream. In this case only the audio stream that is actually played has to be downloaded saving bandwidth. With the new version of our HLS Solution we now also support HLS alternate audio streams. Only those audio tracks that are actually played are downloaded. We extended our Inaris HLS Solution to support encrypted media streams. In a first step we integrated HLS with Verimatrix ViewRight OTT client on an Android TV platform. To fulfill the high security requirements of Verimatrix even for an open platform as Android, Verimatrix is integrated completely on the native C layer. Therefore, it is ensured that no media content can be accessed from JAVA application code. Live TV services are more and more provided by standard Internet connections as OTT services. HTTP Live Streaming (HLS) originally defined by Apple is a widely used streaming protocol for OTT services. HLS supports adaptive streaming to take into account the different available bandwidths. We implemented our own Inaris HLS Solution and integrated it in our Media Player framework on an Android TV Broadcom platform. 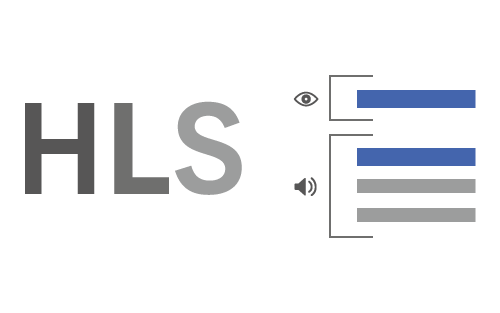 The HLS Solution is implemented platform independent in ANSI C and can be used for the playback of live and for VOD content. The advantage is, that we now have full control of all playback parameters and can optimise and adapt the HLS playback for the used backend streaming server. Fast start of content playback (fast TV channel changes) and short delay to live in the case of live TV can be achieved with this solution. The ANOPAS research project was started in August 2015 with our partners from Fraunhofer FOKUS and TU Berlin and was funded by the Bundesministerium für Wirtschaft und Energie (BMWi). The work on this project was completed in time by July 2017. Meanwhile, the final report has been submitted and thus the project is successfully completed. During the project time we discussed and developed together with our partners many approaches that will help to improve the users’ streaming experience. One of the outcomes is an architecture that can be used as a framework to develop more powerful and smarter adaptation algorithms in MPEG-DASH. The experience we gathered in this research project has led to a strong improvement of our products and know-how in the streaming domain. Many concepts and ideas are also applicable for other streaming technologies like HLS. In context of the ANOPAS project, we decided to include parts of the recently published MPEG-DASH SAND standard (ISO/IEC 23009-5) into our further development activities. The SAND standard (Server and network assisted DASH), defines an architecture and the protocols to allow DASH clients reporting metrics to servers and assist clients on their adaptation decisions. The ANOPAS project will base their communication protocol on SAND and implement some of the SAND features. This will be for example the coordination of multiple clients sharing the same network resources. In this case, clients will issue a request to participate in resource sharing on the network. Following this, the server will assign them the maximum bandwidth in order to ensure the best use of the available resources. The distribution of the bandwidth to each single client may be influenced by resource allocation strategies e.g. fairness or pricing. The ANOPAS research project has been set-up by the partners TARA Systems, Fraunhofer FOKUS and TU Berlin to develop and evaluate innovative adaptation algorithms for adaptive streaming. The main focus is on the MPEG-DASH streaming protocol since this is widely used in web browsers and with HbbTV services. ANOPAS aims at reaching the best possible playback quality, fairness between users in multiple user environments, live streaming with low latency and efficient operation in wireless networks. The generated solutions shall be implemented in prototypes and evaluated in realistic test scenarios. This project has received funding from the Bundesministerium für Wirtschaft und Energie (BMWi) and their innovation program »Zentrales Innovationsprogramm Mittelstand« (ZIM).